Coordinates: 52°45′27″N 6°43′32″W﻿ / ﻿52.75750°N 6.72556°W﻿ / 52.75750; -6.72556 Aghade (Irish: Áth Fhád) is a small civil parish, in the barony of Forth, County Carlow, Ireland. 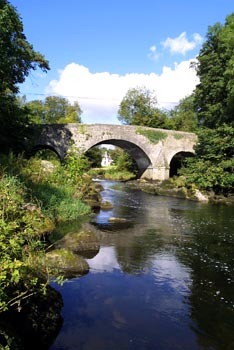 It is 3 miles from Tullow and has a notable bridge over the River Slaney. a church At one time it had a school. All Saints Church of Ireland Church, Aghade, County Carlow (1760-1800) at the coordinates of 285120, 168403. Architectural Description: detached three-bay single-cell Church of Ireland church, c. 1780, built on earlier ecclesiastical site. Renovated, c. 1810, with tower added having needle spire. Renovated and refenestrated, c. 1875, with chancel and vestry projection added. Interior retains group of wall monuments and carved timber panelling to chancel. Before the invention of bridges Aghade was, as the name indicates, a ‘Ford’ or crossing place of the river Slaney. In early times a very important road or rather ‘Pass’ from Dublin to Wexford ran through Baltinglasss, Tullow and Enniscorthy. Hence Aghade must have been a much frequented place. The name of this parish is not of ecclesiastical origin though it is of great and celebrated antiquity as we read from what is known as ‘The Book of Ballymote’. There it is told how Eochaidh, the son of Enna Cennsealach, killed the poet Niall of the Nine Hostages. The High-King pursued him into Leinster, laid waste the province and forced the Leinstermen to surrender Eochaidh to him. He then carried off his prisoners to ‘Ath Fadhat’ on the banks of the Slaney and there he left him with a chain around his neck secured to a stone. As Niall retreated northward, nine of his champions returned to put an end to Eochaidh. When the latter saw them coming the ‘legend’ has it that he put forth all his strength, gave a sudden jerk by which he broke the chain and, seizing an iron bar to which it was secured, attacked and slew his champions. Encouraged by this feat the Leinstermen rallied, attacked Niall’s army, defeated it and pursued it as far as Tullow slaughtering the retreating troops all the way. In modern times, human bones and skeletons as well as mangled pieces of swords and other military equipment have been dug up from Aghade to Tullow. Nothing can be more certain that a bloody conflict took place here at a remote period. In the fifth century Saint Iserninus, Saint Patrick’s nephew, resided in and was buried at Aghade. It is argued that Iserninus in close consultation with St. Patrick founded the church here. ‘The Carlow O.S. Letters’ states an abbey for nuns of the Order of St. Augustine was founded by Dermot McMorogh, King of Leinster, in 1151. He appointed it to be a sub abbey of the nunnery of St. Mary de Hoggis in Dublin. It appears that in the reign of Henry VI (1422 – 1461) 60 acres of land in Ardristian as well as the rectory of Aghade belonged to this Abbey or rather to the head house of that order in Dublin city. The present day church occupies the same site of the former convent. Architectural Description: five-arch hump-back granite built road bridge over river, c. 1760, with ashlar voussoirs, triple keystones and triangular cut waters. Renovated, post-1825, with centre arch rebuilt. The bridge is very popular among locals for fishing, kayaking, swimming and sightseeing. ^ "Photo of bridge". Archived from the original on 2011-07-23. Retrieved 2010-04-13.